Brew strong coffee using the ground coffee and chicory blend and the water. Meanwhile, warm fat-free half-and-half in a microwave or double boiler. 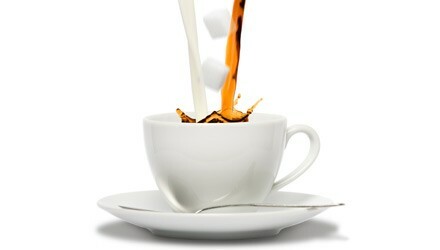 Pour brewed coffee into a large mug; add the half-and-half and Splenda. Stir to mix well. Serving size: 1 1/4 cups. Exchanges per serving: 1/2 fat-free milk, 1/2 other carbohydrate. Carbohydrate choices: 1.